In this lesson we will explore how to use the PWM commands we learned in the last lesson to control the brightness of LEDs in a circuit. (If you do not have a Beaglebone Black yet, you can pick one up HERE.) In order to proceed with this project, you should hook the following circuit up to your Beaglebone Black. Note that we are using pins “P9_14” and “P9_22” which are good working PWM pins. Note the current limiting resistors are 330 ohm. Always connect the long leg of the LED towards the control voltage. The video steps you through the code to control the LED brightness. In Lesson 4 and Lesson 5 we showed how to do digital writes to the GPIO pins using Python. 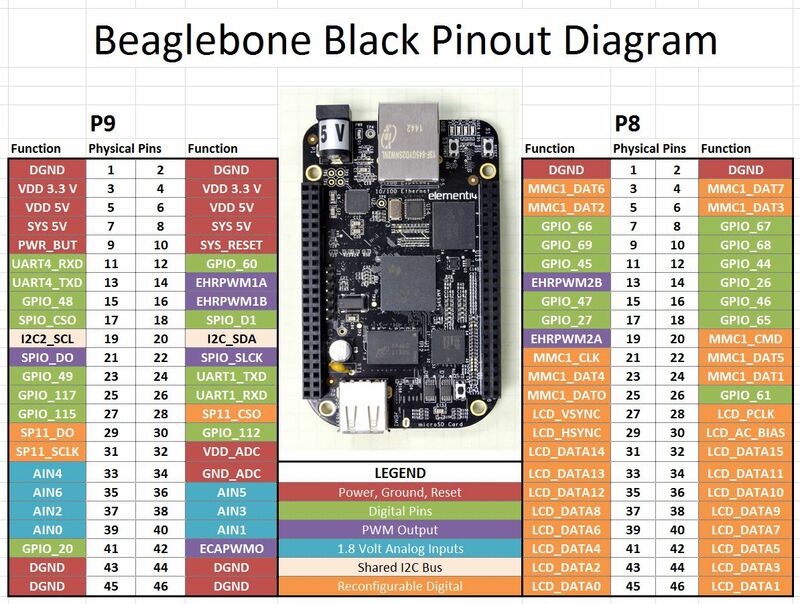 (If you have not picked up your Beaglebone Black Rev. C yet, you can get one HERE) With digital writes, we could generate an output of 3.3 volts or 0 volts. For many applications, we would like analog output, or the in between voltages. The Beaglebone Black, as with most microcontrollers, can not produce true analog output. However, for many applications, an analog output can be simulated by creating a fast on/off sequence where the analog value is simmulated by controlling the ratio of on time and off time. This technique is called Pulse Width Modulation, or more simply, PWM. Consider a 3.3 volt signal, which is turning on and off with a frequency of 50 Hz. A 50 Hz signal has a Period of: Period=1/frequency=1/50=.02 seconds, or 20 milliseconds. If during that 20 millisecond period, the signal was “High” for 10 milliseconds, and “Low” for 10 milliseconds, the signal would act like a 1.65 volt analog signal. The output voltage therefor could be considered the rail voltage (3.3 volts) multiplied by the duty cycle (percentage of time the signal is high. 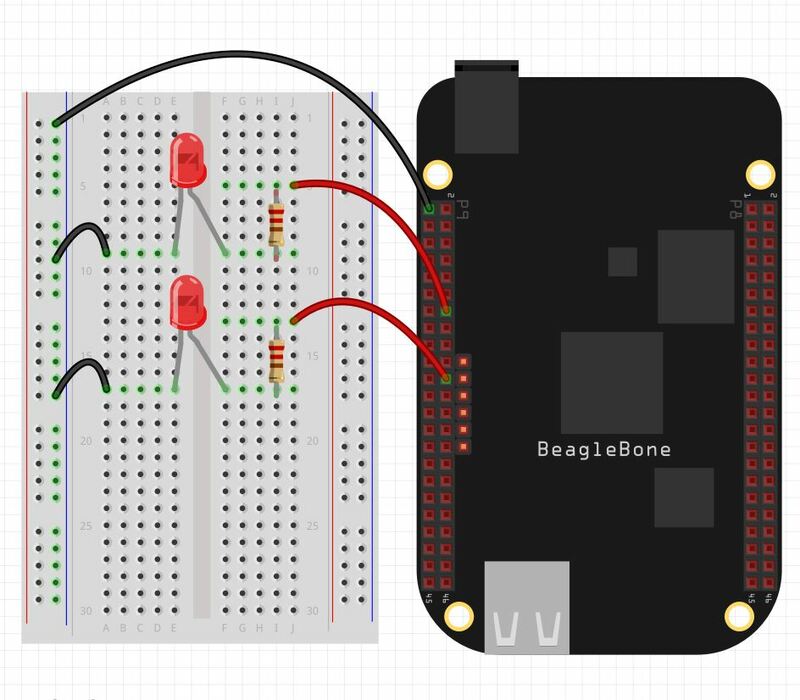 For the Beaglebone Black, only certain pins can be used for PWM signals. In the chart above, the purple pins are suitable for PWM output. You can see there are 7 pins which can produce PWM signals. In this lesson we show you how to control those pins. In order to control PWM signals, we are going to use Python and the Adafruid_BBIO Library. Recent versions of Beaglebone Black Rev. C are shipped with the library already part of the operating system. If you are getting errors indicating that you do not have the library, update your operating system to the latest Debian image for the Beaglebone Black. In order to use PWM in Python, you must load the Adafruit Library. If you have the recent versions of Debian Wheezy for the Beaglebone black, the library will already be on your system. If you do not do an update and upgrade on your operating system. To begin with, you will need to load the library. This command puts a 1000 Hz signal (Period of 1 mSec) on pin P8_13, with a duty cycle of 25%. This should yield a simulated analog voltage of .84 volts. This command would change the duty cycle to 90%, which would simulate a voltage of 3.3 * .9 = 2.97 volts. This would change the frequency to 100 Hz (Period of 10 mSec). Changing the frequency does not really affect the net result of PWM in most applications, although it does matter for many servo applications. Play around with the Python Program below. Connect a DVM to your Beaglebone Black, and measure the DC voltage at the output pin. The DVM should show your anticipated voltages. 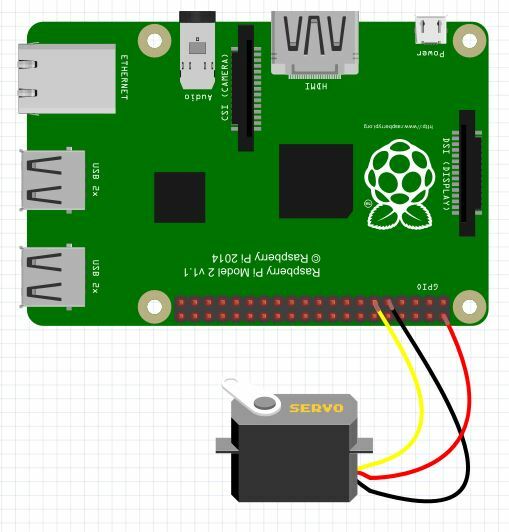 In this lesson we will show you how to precisely control a Servo using the Raspberry Pi. First, for the small servo I am using, I have verified that it is safe to drive from the 5 volt pin (physical pin 2) on the Raspberry Pi. It is possible to damage your Raspberry Pi by drawing too much current out of a pin. So, if you are not sure about the current requirements of your Servo, it is best to power it from a 5 Volt source other than a Raspberry Pi pin. You can still control it from the Raspberry Pi if you use a common ground, but just get the power (red wire) from an external source. For my small servo, I can safely power it from Raspberry Pi physical pin 2. The second point is that to control the servo, you have to use Pulse Width Modulation. So, I STRONGLY recommend that you go through LESSON 27 if you have not already. Lesson 27 shows you how to use PWM on the GPIO pins on the Raspberry Pi. If you are up to speed on PWM, this lesson will go a lot easier. So, with that out of the way, we are ready to hook up our servo. 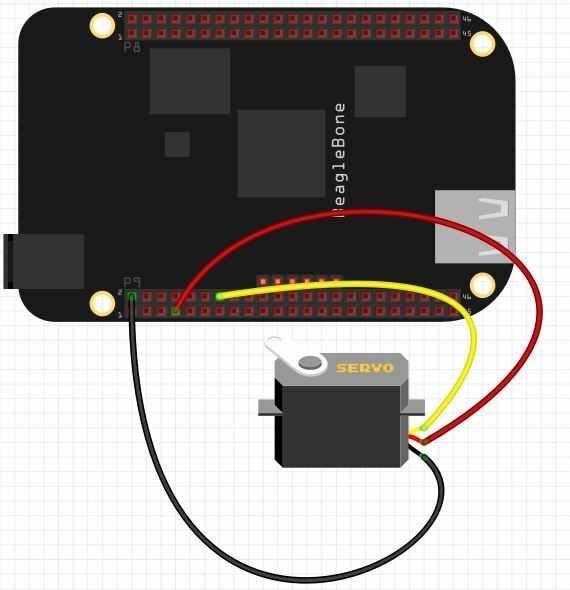 For my servo, the ground wire is Black, the Red wire is 5 volt, and the yellow wire is the control line. If you are using a different servo, you will need to read the instructions to see what the color code is for your three wires, but it is likely similar to mine. The sketch below shows how you should hook the servo up. Notice I have the 5V hooked to the Pi physical pin 2, the servo ground hooked to the Pi physical pin 9, and the servo control line hooked to the Pi physical pin 11. It is important to include sudo, as the Raspberry Pi only allows access to the GPIO pins to the superuser. Hence, you need to enter the python shell as a superuser. When you type the command above, you should be moved into the Python shell, and should see the python shell prompt of >>>. We are now ready to control the servo. We must first import the RPi library. These first steps should be familiar if you did LESSON 27. Remember, it is not DutyCycle that actually controls servo position, it is PulseWidth. We are creating DutyCycles to give us the desired PulseWidth. Now, play around with your particular servo and then find the specific DutyCycles that lead to full left and full right positions. For my servo, I find that full left is at DutyCycle=2, and full right is at DutyCycle=12. With these values, I can create a linear equation that will give me any angle I want between 0 and 180. This will make the Raspberry Pi behave much more like the simple and intuitive operation of the Arduino. We can now get the equation of the line using the point slope formula. I hope this makes sense. 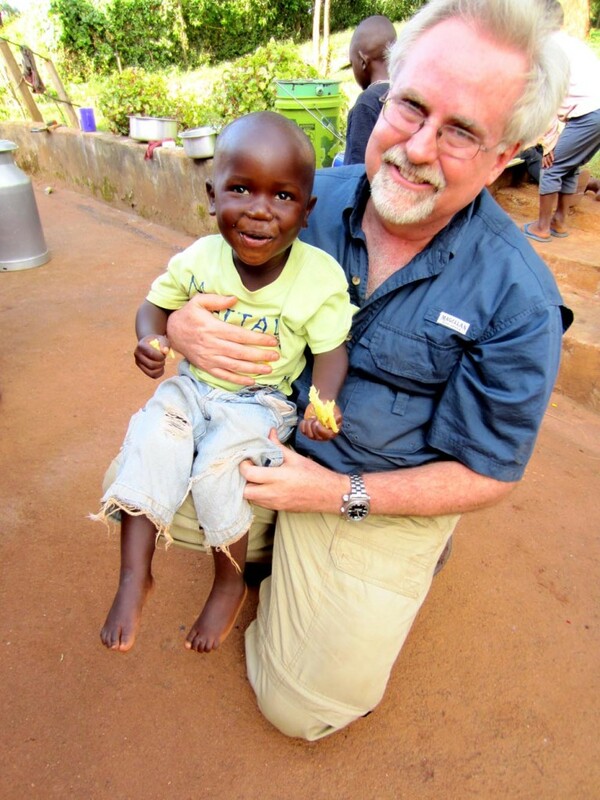 Watch the video as I step you through it carefully. If the writeup above does not make sense, hopefully the video will clear things up.